If you take your skincare seriously then you probably started using an eye cream in your mid-20’s. And if you didn’t, it’s time to catch up. Those dark circles aren’t going to fight themselves. But before you run out and pick up the first one you see, let us tell you why a natural and organic eye cream should be your preferred choice. It’s no secret that so much of our makeup contains potentially harmful and toxic ingredients. From endocrine-disrupting PEG’s to carcinogenic synthetic colors and allergy-causing formaldehyde, the list of toxins is long. And the list of skincare products made with them is even longer. But eye cream has its own specific issues. They’re often packed with preservatives like parabens to extend their shelf life. Fillers and thickeners like silicone are also a common additive in eye cream. And of course, there’s the vicious petrol-derived oils that give them their creamy texture. The best natural and organic eye cream is made without any of those substances. By definition, they’re made with natural and organic ingredients that benefit the skin while they do the job they’re assigned to do – namely, combat the signs of aging and fatigue that accumulates under your eyes. When it’s time to incorporate an eye cream into your skincare routine, make sure you’re choosing from the best natural and organic eye cream. To get you started on the right foot, we’ve listed the top 14 natural and organic eye creams below. A big part of taking staving off the visible signs of aging is taking care of your skin. But as we learn more about the ingredients in conventional products, taking care of your skin also involves choosing skin-beneficial products that don’t compromise your health while they make you look fabulous. So when it comes to treating dark circles and sallow under-eye skin, choose from only the best natural and organic eye cream. You only need a sparing amount of this potent eye cream to start seeing the results that gamma linolenic acid and stearidonic acid bring to your delicate eye area. These natural acids will plump and smooth fine lines as well as uneven skin texture. At the same time, the anti-inflammatory omegas 3 and 6 found in echium seed extract ensure that your skin is soothed and relieved from any dryness or soreness. Made with 74% organic ingredients and no alcohol, synthetics, artificial fragrances, or other irritants. 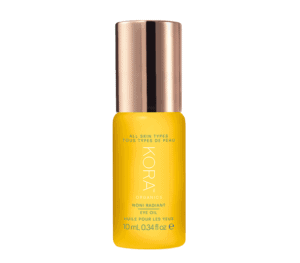 Although certified organic ingredients like noni and tomato fruit make this eye oil a weapon you need in your anti-aging arsenal, what we really love about it is the unique rose quartz roller ball applicator that makes application both simple and soothing. It also combines Kahai oil, coffee seed oil, and antioxidant-rich marine bamboo extract – three more standouts in a heavy-hitting list of brightening and toning ingredients that you’re sure to love. 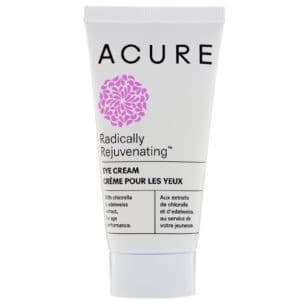 Acure uses plant-derived ingredients to achieve anti-aging perfection. In this eye radically rejuvenating eye cream they’ve included plant stem cells that restore your skin’s cells as well as chlorella & edelweiss extract to protect your moisture barrier – two very important functions for aging skin that tends to lose hydration and doesn’t shed and replace skin cells as rapidly as it once did. That means it not only fights fine lines and wrinkles, it also reduce puffiness and dark circles. This unique formula includes the rare vitamin K – part of a vitamin biocomplex that visibly reduces the appearance of dark circles by healing and repairing your capillaries and calms the kinds of inflammation that result in redness and puffiness. But Eminence didn’t stop there. They also added shea butter and the active ingredient wild plum for extra anti-inflammatory strength that leaves skin feeling calm and cooled. For something a little different, Skin Owl has created an eye concentrate that can actually be used to treat dull and fatigued skin on the forehead and cheeks as well. And when they say concentrated, they mean the formula contains high concentrations of soothing and smoothing ingredients like aloe and cucumber fruit as well as strengthening and firming ingredients like hyaluronic acid, periwinkle, and licorice. You can even increase the potency of the treatment by placing it in the fridge before using! Caffeine doesn’t just wake you up from the inside-out… it can also be used topically to wake up tired eyes. That’s why this eye cream has three different varieties of circulation-boosting and cell-stimulating caffeine: green coffee beans, green tea extract, and coffee cherry. Combined with a healthy amount of aloe, it’s a gentle and cooling treatment that can be used both during the day and overnight. When you notice sagging and sallow skin, your body is telling you it needs help with cell regeneration. As you age, your body needs help shedding and replacing the built-up dead skin cells that cause circles as well as discoloration and makes you look tired. In answer to this problem, Juice Beauty developed a proprietary blend of fruit stem cells and vitamin C that improves your skin’s elasticity and firmness. And to take it one step further, they added jojoba and shea butter for a rich and creamy texture that also hydrates and protects your skin. 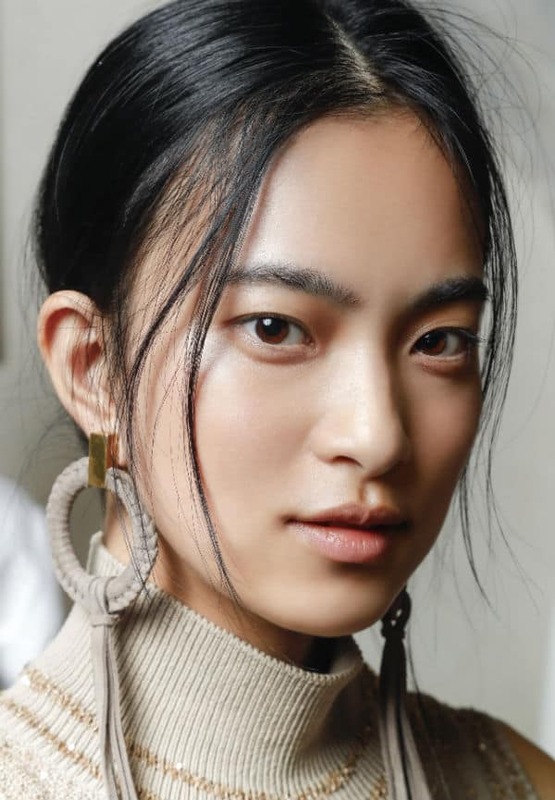 Not everyone struggles with dark circles; in fact, many of us are more concerned with the crow’s feet that can start developing as early as our mid-20’s. Make sure that the next time you smile for the camera, your eyes aren’t overshadowed by the wrinkles and fine lines collecting in the corners. Delivering extreme hydration via aloe, mango butter, coconut oil, and olive oil, this restorative cream erases crow’s feet and other fine lines for age-defying results that last. 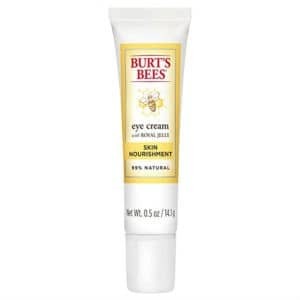 Burt’s Bees designed an entire Nourishment Face Care Collection that harnesses the healing power of bee-byproducts like royal jelly: one of nature’s more powerful substances in relation to skincare and taking care of the fragile area around your eyes. 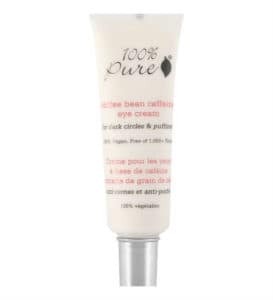 Hypoallergenic and dermatologically tested like all Burt’s Bees wonderful products, this night cream also has vitamin A, B2, and E for added healing benefits that don’t clog pores. Safe and gentle enough for use twice per day, this lightweight serum is formulated a little differently than most on this list. Specifically, it contains peptides that boost collagen production and help repair the skin around your eyes and make it appear more plump, supple, and radiant. Adding to the specialization of this serum is its ability to target your lymphatic drainage system and increase microcirculation to reduce dark circles as well as the appearance of fine lines and wrinkles. 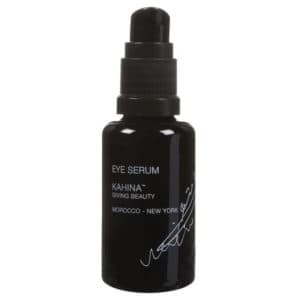 Your skin will literally soak up this fast-absorbing and highly concentrated serum that’s designed for treating the contour of your eyes. 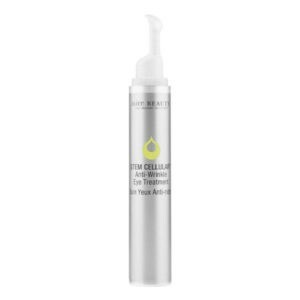 Multi-Correctional in that it targets dullness, elasticity, and strength, this eye treatment hydrates through nutrient-dense, macro and micro-algae extracts. 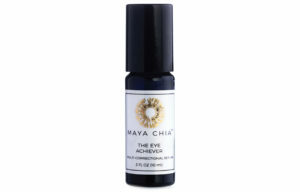 At the same time, it protects and builds strength with the antioxidant power of exclusive plant oils derived from chia, raspberry, black cumin, and rooibos. For a 100% organic solution to your under-eye problems, invest in this high-performance serum blended by the experts at Bottega Organic. 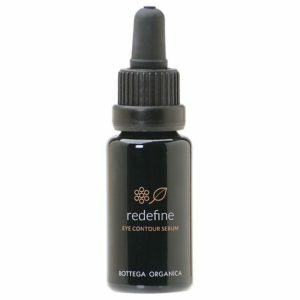 Specially crafted to relieve dark circles, inflammation, and crepey skin, Bottega Organic packs the maximum concentration of age fighting molecules you can fit into this 15mL bottle: bright red blossoms of prawn sage, high mallow, cucumber, horse chestnut, as well as other carefully selected herbal and fruit extracts. The natural ingredients are so fresh, you’ll have to use this serum within 2 months of opening it (but once you see the result you’ll have no problems accomplishing that!). Combining the capillary-repairing properties of vitamin K with the light-refracting benefits of mica and silica, this 2-in-1 is a serum that corrects damage that’s already done and also acts as a cosmetic concealer that reduces the appearance of the visible signs of aging. Use day, night, or whenever you need to look like you’ve got your full 8 hours of sleep – you’ll notice an immediate difference in luminosity and radiance. Best for mature, sensitive, and dry skin, this creamy eye treatment combats fine lines and wrinkles as well as a loss of skin density. How? 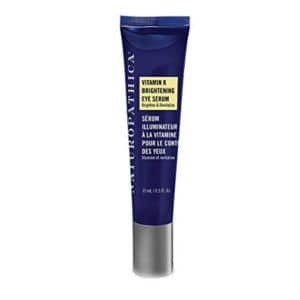 It’s formulated with cell-communicating organic blue green algae that renews the skin around your eye contour and restores elasticity and firmness. And once it’s worked its magic revitalizing your skin, it protects it with antioxidizing organic pomegranate and locks in the effects with hydrating hyaluronic acid. 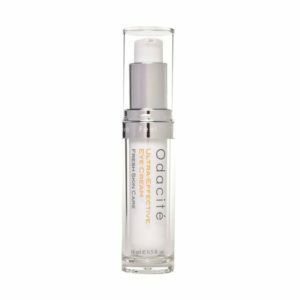 Alternatively, Odacite’s Ba + S Contour Concentrate serum ($42) is rich in Vitamins A, E & F. What really makes this one stand apart is the cold-pressed, certified virgin, wildcrafted Baobab seed oil which is capable of targeting a multitude of sign of aging that effects the eyes. And for more information on the best eye creams for the visible signs of aging, make sure you check out our guide on anti-aging eye creams. 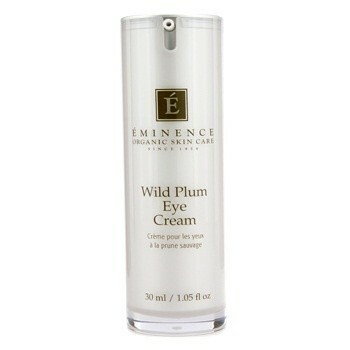 Eye creams can reduce the appearance of dark circles that make you look both tired and aged. But they can also be used to restore skin elasticity and firmness, brighten dull texture and skin tone, and repair the contour of your eyes. And to accomplish this task on one of the most delicate areas of skin on your entire body, you only want the best natural and organic eye creams filled with skin-beneficial and healthy ingredients.